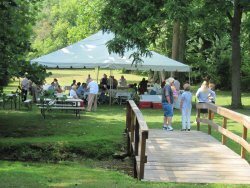 After the service, we made our way across the wooden bridge behind the old stone building to have lunch and conversation under a canopy erected for the occasion. Mike Elsea brought in a band, who played music later in the afternoon. Imagine the citizens of the tiny village of Snickersville in 1851 deciding they need a church in the community. First order of business was to purchase a parcel of land which was accomplished for the tidy sum of $50.00. 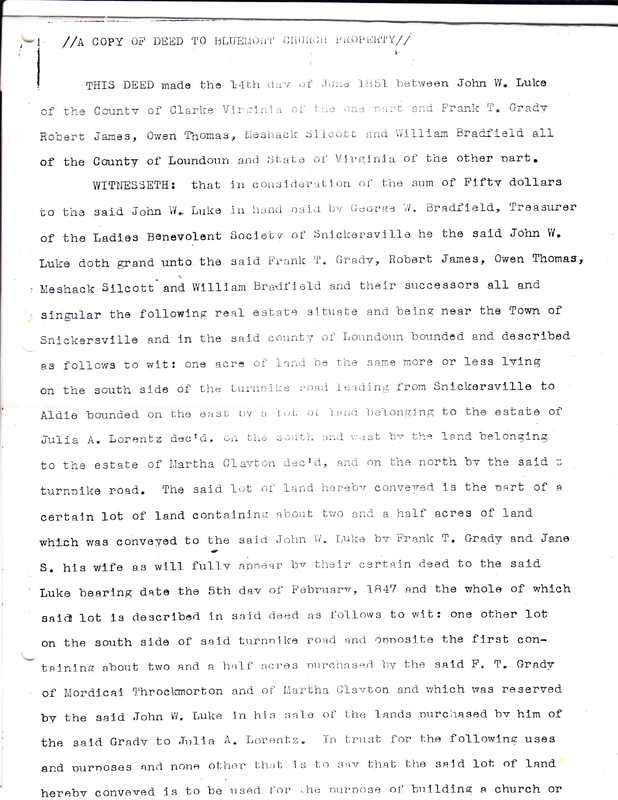 The funds for this approximate one acre were paid by the Ladies Benevolent Society of Snickersville. The treasurer of this ladies’ group was a man named George W. Bradfield! 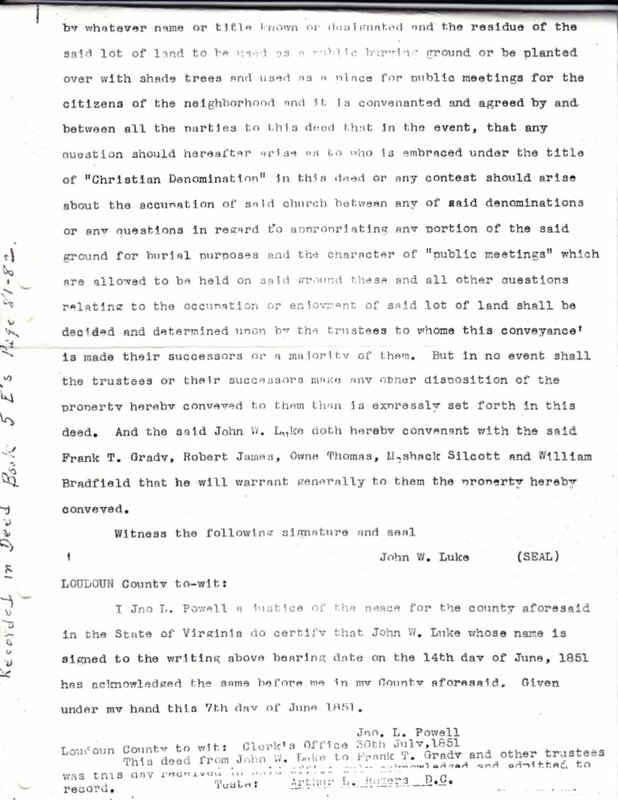 The land was granted to Frank T. Grady, Robert James, Owen Thomas, Meshack Silcott, and William Bradfield and their successors. The Methodist Church immediately began worship here and has continued now for 160 years. Many of you have seen the inscription on the Bible here on the pulpit….it says….”In memory of Mary Ann Elizabeth Hesser Porter who attended Bluemont Methodist Sunday School when a little girl. Year 1863”. No one in our church today knows who this person was but it is part of the history of many generations of worshipers here. The land behind the building was to be used as a public burial ground (which it was during the Civil War) or planted with shade trees and used for public meetings. This is where we will be serving lunch after our service today. Please join us & stay for special music that Mike Elsea has arranged with his band which he just brought together for this occasion. This church has been home to church mice, black snakes (we have stories), ants, numerous ministers, but most importantly, the home of THE WORD. We all admire this devotion and the beauty of this building, but it is a building and WE are the church! Isabelle Dawson - Faithful member of the WSCS, predecessor of the United Methodist Women. "Aunt Freddie" Osburn Foerster - Pianist and worked tirelessly to raise money to purchase our organ. Emma Mann, a quiet, background person who accomplished so much and never sought recognition. Eston King - Superintendent of Sunday School and teacher of the teenage class. Ruth Meihm - Organist and choir director for many years. Maidlen Virts - Church treasurer for decades and Sunday School teacher. Ivy Cochran - Sunday School teacher, leader of the Youth Group, mentor, and an inspiration to all. Libby Stearn, - Very active in the United Methodist Women and Fair chairman for years. Betty Mitchell - Past Chairman of the Board and great “hands-on” worker in the church. Elva Buddenhagen - Pianist/organist and organized our Hymn Sings, which became a tradition. And most recently, Ralph Cochran and Wendell Denney, both members of the Men For Christ and strong witnesses to the glory and grace of our Lord, Jesus Christ. We are the church of today and our young members are the church of tomorrow. Encourage them as we pray that this church family will exist for another 160 years! God bless!